Elaine Devereaux accepts award on behalf of Castlebar Four Days' Walks Festival. Left to right John Kilkelly, Vivienne Kyne President Rotary Castlebar, Elaine Devereux Castlebar Four Day Walks, John Kilcullen, Rotary Club. Pic Frank Dolan. 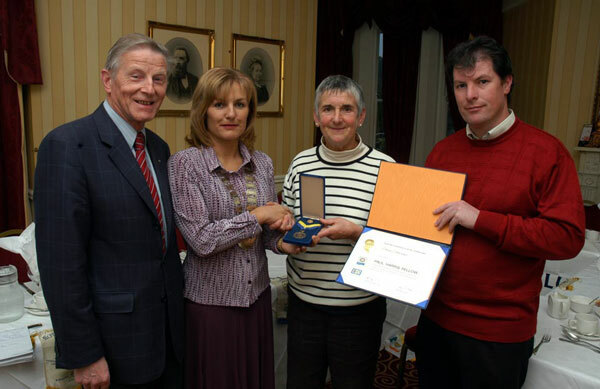 Elaine Devereaux of Castlebar International Walking Festival recently received an Award from Castlebar Rotary. This Award was given in recognition of her service to the Castlebar Community and to the Castlebar International Four Days' Walks. Ms Devereaux received the prestigious Paul Harris Fellow Award from Vivienne Kyne President of Rotary Castlebar. According to Kyne "Rotary and the Castlebar Walks share a common goal of bringing people together in a spirit of fellowship". She also commented on how successful the festival is with 900 walkers participating in this years festival. The event has been running since 1967 and Ms Devereux has been actively involved with the walks for over 24 years. Ms Devereaux and her fellow members were recognised by Rotary for their exceptional contribution to the Festival and the town of Castlebar in a presentation ceremony in Breaffy House Hotel. from left, John Kilkelly, Vivienne Kyne President Rotary Castlebar, and John Kilcullen. Picture. Frank Dolan.